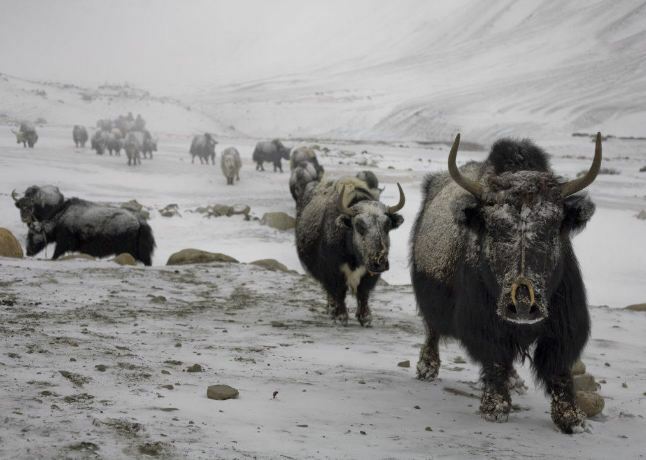 (TibetanReview.net, Feb10’19) – Thousands of livestock and hundreds of wild animals have died as snowstorms lasting for days hit all the one city and five other counties in Yushu (Tibetan: Yulshul) Prefecture of Qinghai Province, reported China’s official Xinhua news agency Feb 9. Roads in many areas of the Tibetan Prefecture were reported to be covered under snow as deep as 45 centimetres. The report did not say anything about human casualties or fatalities. Drapa Sum, director of the health center in Gyeldo County, one of the worst-hit areas, has said he and his colleagues this week visited a number of blizzard-hit villages, some located 5,000 metres above mean sea level. Strong winds were stated to be blowing snow to block the roads despite the efforts to clear them, making relief efforts difficult and extremely dangerous. The local government was reported to have sent vets, medicine and fodders to the blizzard-hit areas.